Children in hospital gowns with Looney Tunes characters. 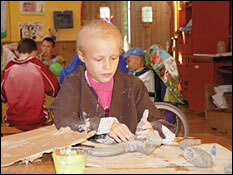 A child working with clay in the arts & crafts room at Paul Newman's Hole in the Wall Camp. Perhaps it all started with the smile of a four and a half year-old boy who finally let go of his mother's arm to enjoy an arts and crafts program at the Los Angeles Ronald McDonald House. Or maybe it was the eventual giggles of a two year-old girl so frightened by her pending radiation treatment that she would not get into position for the procedure. Or maybe it was simply the heart and soul of someone who wanted to do something special for children with cancer. Probably all these factors combined to compel one woman to found the newest and brightest hope for children with cancer. Matti Contopulos, whose professional background is cancer, devised and implemented art/activity programs specifically for oncology patients and had been in the field for over a decade. Having seen the courage, strength and need of the children, Matti found a new way to bring fresh hopes and more than a few smiles to the children with cancer and their families. Founded in 1987 by Contopulos, Children's Cancer Research Fund (CCRF) is a non- profit organization dedicated to two important goals: to provide support on a national level for clinical research in pediatric cancer and to improve the medical environment for all children. CCRF was started with the inception and implementation of a remarkable project that would help change the medical environment for all children. Through the combined efforts of CCRF, Superior Surgical Mfg. Co., Inc., and the Walt Disney Company, Mickey and Minnie Mouse along with other Disney characters were imprinted on pediatric hospital gowns throughout the country. Since 1990, CCRF and Superior Surgical have been working with Warner Bros. in bringing the Looney Tunes characters to the medical setting. Bugs Bunny, Daffy, Sylvester and their friends are bringing smiles to all children in hospitals. Matti knew she had reached her goal of creating a friendly and warmer environment when UCLA Medical Center reported that the kids loved the gowns and were "stealing" them! Continuing Matti's efforts to create a warmer medical environment, Bugs Bunny and Daffy Duck are now on the "What's Up Doc?" 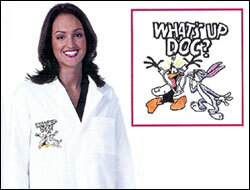 doctor's lab coats. THE WALT DISNEY COMPANY - Mickey and Minnie Mouse, Donald Duck, Pluto and Goofy on children's hospital gowns throughout the country (1987 - 1990). The entire royalty donated to CCRF. WARNER BROS. - Bugs Bunny, Taz, Daffy Duck and more on children's hospital gowns throughout the country (started 1990, ongoing). A percentage of royalty donated to CCRF. The gowns and Doctor's lab coats have been featured on the television show ER (1995/1996). RECYCLED PAPER PRODUCTS - KIDS 4 KIDS MAKE-A- CARD project. A line of Holiday Cards featuring artwork of children (administered by schools throughout the country) sold with a percentage of the proceeds benefiting CCRF (Fall 1990). Children's Cancer Research Fund has created and hosted many successful events. To find out about our past events and our events this year, please go to "Events". RESEARCH GRANTS - CCRF has, in over 27 years, awarded 75 grants on a national level in clinical research in pediatric oncology. PAUL NEWMAN'S HOLE IN THE WALL CAMPS - In 2009, CCRF, through money raised from the 4th Annual Kids 4 Kids RUN/WALK, provided supplies for the arts and crafts programs at Paul Newman's Hole in the Wall Camps (ongoing). MATTEL CHILDREN'S HOSPITAL UCLA - CCRF funded the Doctor/Patient Conference Room on the Pediatric Floor at Mattel Children's Hospital UCLA in 2009. CAMP DREAM STREET - In 2006, 2007 and 2008, CCRF funded art programs at Camp Dream Street through the money raised from the Kids 4 Kids RUN/WALKs. COUNTY USC HOSPITAL - CCRF funded supplies for a playroom at County USC Hospital in 2008. PLAYROOM - CCRF has funded a new playroom at the Ronald McDonald House Los Angeles. PLAY THERAPIST ASSISTANT - CCRF has funded a play therapist assistant to help keep the play yard open for the children at the UCLA Medical Center. SUMMER SCHOOL - CCRF has funded a program for children with cancer at UC San Diego Medical Center to attend summer school. TEEN IMPACT - CCRF has funded a retreat for "Teen Impact" (Children's Hospital Los Angeles support group for teenagers with cancer). TOYS AND MORE - CCRF continues to receive donated toys, games and videos which are then distributed to children at hospitals around the country. CCRF has been the recipient of many events. To find out more please go to our "Friend's Nationwide" page. "We appreciate every single contribution we get and are proud to have achieved so much so quickly. But, we've got a long way to go and we will stay with it until we have given some very important children a very big reason to smile. As we continue to fund research, I will always hope for the truly special moment when a doctor can say, 'Swallow this and it will all be gone in the morning!'"